Southcliffe is a fictional seaside town in Essex. 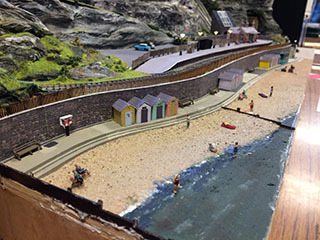 It is inspired by elements of Westcliff-on-sea, Leigh-on-sea and Southend and consists of a beach with beach huts on the promenade, a station at the foot of a cliff, a Funicular railway and part of the town on the hill above. At the top of the cliff railway stands the Southcliffe Hotel looking down the hill towards ‘ye old Smack’ where the traveller can get a pint before either joining the disco in full swing upstairs, join the queue for the Fish and chip shop or take a wander down the hill to the station and beach beyond. When the day is done weary travellers and holidaymakers return to the Hotel using the funicular railway. 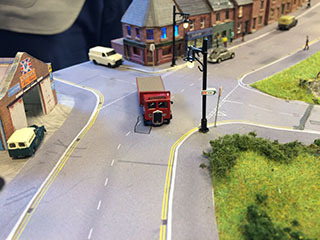 Southcliffe came into existence as an entry to a competition run by the One Model Railway club of Needham Market. The requirement was to build a layout on a 2ft by 3ft board. Three or four designs were put forward by members and one was picked. The track plan is designed to allow the finished layout to be integrated into the ‘Modular’ layout that is also under construction by the club. It is wired for DCC operation. 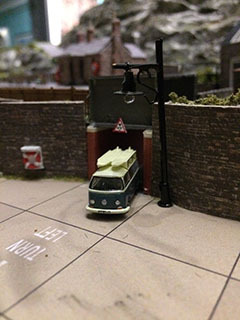 Buildings are a mixture of Metcalfe, Scale scenes and Smart Models products. With the cars of the Funicular railway slowly moving up and down plus working street and platform lights and many of the buildings light there is constantly something changing. All the lighting is controlled by three Arduino microprocessors driven off the DCC Supply. Southcliffe is built on a single board made from 9mm ply with a solid top. The track is code 40 from the British Finescale track system. Two points off scene are hand built by soldering Code 40 rail to copper clad sleepers and are driven by DCC Concepts Cobalt motors. To 2mm scale N gauge. 3ft long by 2ft wide in 1 section. The layout is primarily operated from behind so requires (ideally) 4ft by 4ft. Lightweight, Constructed from Plywood, quick and simple to erect and knockdown. It can be operated by 1 but ideally 2 operators. Attendance for expenses only, (transported in a single car from South Essex). It is equipped for full DCC operation. Operational periods can range from early 1960s to yesterday.